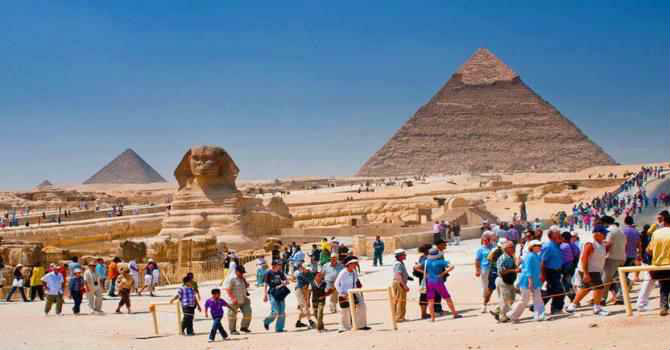 Our guide will pick you up morning upon your cruise arrival and transfer with private modern van to explore Giza Plateau to visit the three large pyramids of Cheops, Chephren & Mykerinos. It is the only surviving of the 7 Wonders of ancient world, continue to the mysterious Sphinx and the valley temple of king Chefren. Get your lunch meal in good quality restaurant then drive to Saqqara the burial site of the most Pharaohs of the Old Kingdom, wander the first pyramid ever built in ancient Egypt, known as the "Step Pyramid of King Zoser". It has been designed by the famous genius architect "Imhotep", you will visit some Mastaba tombs and the pyramid of Teti. Stop at the Papyrus Institute to learn how ancient Egyptians made it and purchase some souvenirs before returning back to Alexandria port.